Automate a Time Consuming Chore! We know that there's a reason so many programs have a faculty member called a “clinical coordinator.” It's a time consuming job to match students to locations, to notify students and sites of the schedule or of changes, to figure out who's best assigned where, to know how many hours each student might have at the end of a rotation based on the clinical or lab slots they've been assigned. 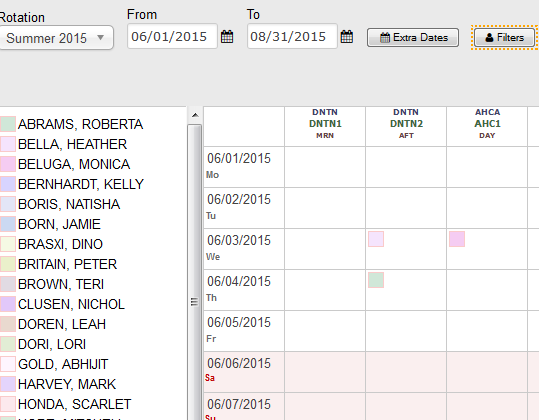 The Trajecsys Report System can move your spreadsheet-based system online, providing a faster way to schedule, re-schedule and visualize who's where. Whenever a rotation schedule is finalized, sites and students can know at once who’s going where, on what dates. Updates made by faculty can be automatically reflected in the schedule available to both sites and students. Let us show you how we can re-shape and speed this tedious process up using our online tools to calculate hours and communicate assignments rapidly.